In 2018 , to reference a song from the album the markets to date are, ‘Running to Stand Still’. Let me explain what I mean. Most market participants consider the market to be forward looking. The Equity markets are considered to reflect the collective view of participants of the conditions in 9+ months time and bonds expectations some 6+ months from now. The driver of equities of the past few years has been accommodative financial conditions in concert with positive earnings growth and low inflation (‘Goldilocks’ environment). Moving forward the consensus view is that earnings growth should peak between Q3 18 and Q1 19. This would mean that we are now right in the window when the market is considered to be fully priced for positive earnings growth. The bond market has predominantly been driven by inflation expectations with ‘temporary factors’ holding down inflation due to fall out of the data through May-September. The market is now pricing US rates above the FOMC’s expectations (see chart below) meaning somewhat higher inflation and synchronized global growth is now factored into the shorter maturity bond market yields. We are therefore left to consider another U2 Joshua Tree hit ‘I still haven’t found what I’m looking for’. That is, with the market keenly priced for inflation to pick up and for further earnings growth, we have now seen reversals in both equities and bonds since February. Given the markets are efficient enough to price publically available information and the fact we are in sight of both peak earnings along with peak inflation expectations, it is likely we have seen the near-term top in equity and bond markets. Further let’s consider the geopolitical environment. The event risk, as we meet the new cast for Season 2 of the Trump White House Show, is clearly trade protectionism. The hot spots from last year around North Korea and Syria are better contained. 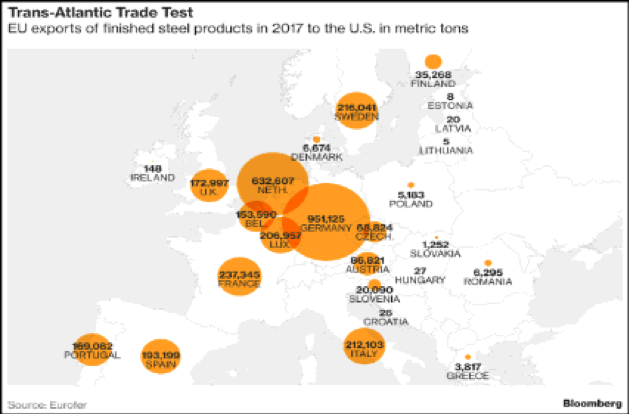 Whilst we can wax lyrical about trade protectionism being counter to the global communities best economic interests it will take more restraint than either China or the EU could muster should we see tariffs on Chinese goods and EU finished steel products. In the case of the EU the impact is heavily weighted towards the Germans and Dutch. We should be alert to the investment policy of large surplus nations being affected by their trade agendas which would imply less support for US asset markets. Whilst the US is solely focused on the fight against deficit trade balances, China may prefer to focus on the capital account as part of its overall balance of payments. The data has shown a steady but modest decline in Chinese purchases of US Treasuries since mid-last year. So, whilst the US is set to increase its regime of taxing its trading partners it is important to consider the effect of retaliation via both the trade and capital channels. This is clearly an issue at the macro level for the rate at which the US funds its twin deficits but further for US finished steel exporters (Boeing, Tesla et al and the defence sector). To round out the references to U2 ’s Joshua Tree it may well be that the global community look at trade on a ‘With or Without You’ basis when it comes to the US. Given the US has been the only source of final demand globally its going to be impossible to find the consumers to pick up the slack if this were the case. Demand simply cannot be replaced elsewhere. So, that raises the question, what are we looking for as drivers of the market from here and what is best investment strategy? In all, the truth is likely to be found if we stop looking for the large trend moves we have seen over the past few years. Markets spend the majority of their time in ranges. An annual move in a market of 5% is highly likely to have occurred as a combination of shorter term moves of multiples of 5%. This year is shaping up as one in which we do indeed look back and see plenty of reactive volatility as markets continue to run to stand still. This occurs towards the end of cycles as psychologically we weight events from the recent past as more likely to re-occur than those in the more distant past. A strange instinct and one that leads the market to look for double digit moves in markets that have had double digit moves the year before. Often on the basis of the expectation that recent conditions will continue to be the driver of future outcomes. Inevitably the market moves on to focusing on something else as the driver and the best managers are the ones who recognise what the driver of markets will be during these shifts and position accordingly. The rest after all will be dismissed in hindsight as the noise not the trend. Thus, as sophisticated investors, can the answer really be not to look for a trend, not reactive to the point data but rather realise that we are in a transition period where picking up alpha from fading volatile but range bound markets will be the driver of alpha until the next big driver of markets asserts itself. The major candidate to drive markets from here is the unfortunate mix of slightly higher rates coinciding with peak growth but slightly higher producer price inflation and concerns about global debt levels. This is a reversal of the EPSg drivers we have recently experienced as debt becomes more expensive and growth slows. Corporate credit and equity markets will be certain casualties. The mix is also negative for indebted sovereigns but favours the surplus nations. Relevantly not much has been done to repair sovereign balance sheets during the period that will surely be seen as the best last chance for governments to repay debt. Globally, in the next downturn when it does come we will all be performing without the fiscal net available during the last great downturn in 2008-09. The stark reality of no meaningful fiscal response globally to a downturn means we should all take responsibility to have our own safety nets in our investment strategies. There will be no next bail out other than the one you have put in place in your portfolio. Low beta alternative managers with high quality returns to risk (outperformers on sharpe ratio) have a place in providing this safety net in your portfolio.